Sorry,the application deadline for this course has expired. Payment Details: to cover tuition and training materials only. Governments and other actors have been urged to promote an active and visible policy of mainstreaming a gender perspective in all policies and programs so that before decisions are made, an analysis is made of the effects on women and men respectively. The goal of gender audit is to contribute to strengthening processes by providing an assessment of any differential impact on males and females because of policies, programs, organizational structures and processes within organizations. Further to this, the goal of gender audit is to identify strategic initiatives that can be implemented to build commitment to and strengthen capacities for gender mainstreaming. Gender practitioners and managers, therefore, need this special skill of conducting a gender audit. Middle and senior level officers/managers in project management, gender focal point persons, human resources managers. African States who are members of AU are now implementing "Women's Decade; 2010 - 2020 with emphasis on gender equality and women empowerment" as a tool for achieving the elusive MDGs and BPoA. This calls for leveraging gender diversity in the work place and closing the gender gaps in management. Many factors inhibit economic growth in Africa. Economic analysts portray a consistent picture of gender-based inequity and inequality, acting as a constraint to growth and poverty reduction. This 2 weeks course aims at providing knowledge and skills to officers and staff from Public and Private sectors on how to mainstream gender in management and promote gender diversity. Learn and practice how to analyze organizational policies and practices so as to promote gender-sensitivity. Strategize on how to prepare an engendered equal opportunity employer policy as well as organizational budget. The impact of Gender inequality on economic growth and sustainable development. 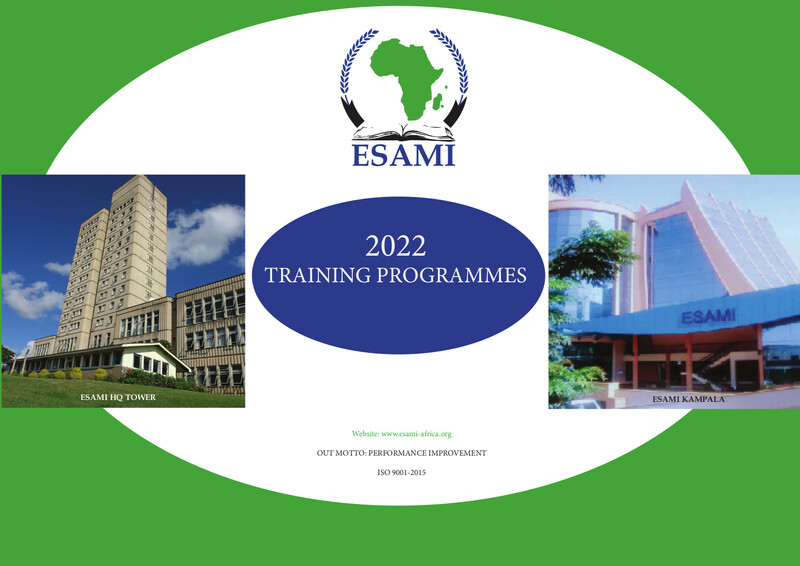 Course director and ESAMI facilitators will use participatory methods appropriate for attitudinal change. Learn on how to leverage gender diversity in modern organizations. Middle and senior level officers/managers, gender focal point persons. African States who are members of AU are now implementing "Women's Decade; 2010 - 2020 with emphasis on gender equality and women empowerment" as a tool for achieving the elusive MDGs and BPoA. This calls for understanding why Gender is a critical development variable in Africa's development efforts. Many factors inhibit economic growth in Africa. Economic analysts portray a consistent picture of gender-based inequity and inequality, acting as a constraint to growth and poverty reduction. This 2 weeks course aims at providing knowledge and skills to officers and staff from Public and Private sectors on how to mainstream gender in public sector management and promote gender equality for sustainable development. Many factors inhibit economic growth in Sub-Saharan Africa. Micro-level analysts portray a consistent picture of gender - based asset inequality, acting as a constraint to growth and poverty reduction. A National budget is a critical policy document for promoting economic growth and sustainable development. Strategize how to prepare engendered budgets and Poverty reduction strategy programmes. Gender inequality, HIV/AIDS and their impact on economic growth. Monitoring and evaluation, engendered indicators. Planners, financial analysts and those involved in sector Policy formulation. These should be from the planning departments of all Government Ministries, Ministry of Finance, Office responsible for Poverty reduction strategy and Training Institutions. Develop the gender action plans for comprehensive integration of gender equality at all levels of the organization. Moving from analysis to action plans. Many factors inhibit economic growth in Africa. Economic analysts portray a consistent picture of gender-based inequity and inequality, acting as a constraint to economic growth and poverty reduction. This course aims at providing knowledge and skills to officers and staff from Public and Private sectors on how to mainstream gender in management and promote gender diversity so as to achieve the AU agenda of 50/50 gender parity. Strategize on how to prepare an engendered equal opportunity employer policy and budget. -The impact of Gender inequality on an organizations' competitiveness. -Promoting work/home support for creating a level playing field for men and women workers. Commissioners, Directors, Planners, Economic modelers and those involved in Public Reforms. Gender Focal points and officers with targets to gender equality in ministries and management. The workshop aims at sensitising top executives on the linkages between Good Governance, gender and change management as pre-requisites for effective leadership and sustainable development. Promote engendered democratic Governance in the Public and corporate sector. Target GroupThis course has been designed for Policy makers at the level of Permanent/Deputy Permanent Secretaries, Commissioners, Directors and Chief Executive Officers of Corporations. The overall objective of the programme is to enable managers acquire skills and knowledge on gender concepts and gender issues for managerial effectiveness. Today's leadership thinkers are emphasizing gender equity and equality (Peters Tom, in Re-imagine 2009). Wilson (2007) states that: "Closing leadership gap, add women and change everything" African Countries are implementing the women decade and yet many officers and employees in many organizations are not aware. AU is implementing 'Women's Decade; 2010 - 2020 as a strategy for achieving the elusive MDGs and BPoA. This calls for understanding why Gender is a critical development variable in Africa's development efforts. This course aims at providing knowledge and skills to officers and staff from Public and Private sectors on how to mainstream gender in public sector management and promote gender equality for sustainable development. Review and strategize key areas for implementing the African Women Decade. Developing gender responsive policies and budget. to promote an active and visible policy of mainstreaming a gender perspective in all policies and programs so that before decisions are made, an analysis is made of the effects on women and men respectively. The goal of gender audit is to contribute to strengthening processes by providing an assessment of any differential impact on males and females because of policies, programs, organizational structures and processes within organizations. Further to this, the goal of gender audit is to identify strategic initiatives that can be implemented to build commitment to and strengthen capacities for gender mainstreaming. Gender practitioners and managers, therefore, need this special skill of conducting a gender audit. Middle and senior level officers/managers in project management, gender focal point persons, human resource managers. People in any organization are a key resource and main drivers of sustainable economic and social development. Investing in the excluded and strategic inclusion of women in top level position of companies has shown that, such companies tend to outperform those that do not (Schwab K; Global Gender Gap, 2014). Strategic mainstreaming gender in leadership and management of Governments and companies will ensure increased performance in service delivery and well as improved financial status. The scope of this course is to identify barriers to gender equity and equality and establish strategies for successful gender mainstreaming in management. mainstreaming at work, and improve organizational performance. Carryout engendered policy formulation and engendered budgeting. Engendering organization's plans, programmes and budget. economic and social development. Investing in the excluded and strategic inclusion of women in top level position of companies has shown that, such companies tend to outperform those that do not (Schwab K; Global Gender Gap 2014). Strategic mainstreaming gender in leadership and management of Governments and companies will ensure increased performance in service delivery and well as improved financial status. The scope of this course is to identify barriers to gender equity and equality and establish strategies for successful gender mainstreaming in management. The course is designed for men and women leaders looking for solutions to gender mainstreaming at work, and improve organizational performance. Carry out engendered policy formulation and engendered budgeting. Today's leadership thinkers are emphasizing gender equity and equality (Peters Tom, in Re-imagine 2009). Wilson (2007) states that, "Closing leadership gap, add women and change everything". African Countries are implementing a women decade (2010 – 2020) and yet many officers and employees in many organizations are not aware. This programme aims to train women and men to the critical gender issues and concerns that continue to constrain gender equity and equality in Africa, and continue to hamper planned development efforts. Senior Government officials and Programme/project managers involved in planning and implementing national or regional development programmes/projects. This course is relevant to public servants or staff from development oriented NGOs. Strategize how to conscientize men to promote gender equity. Leveraging gender diversity in national development programmes and align to the global sustainable development goal. It is simply impossible to become a great leader without being a great communicator. Great leaders might talk about their ideas, but they do so in a way which also speaks to your emotions and your aspirations. Research findings by Ken Blanchard did show that, inappropriate communication was cited as the number one mistake leaders make. Too often women leaders either don't communicate, over-communicate, communicate inappropriately through outbursts, anger, or blaming, or simply don't communicate clearly. This comprehensive course, is dealing with the unique challenges women confront in the organizational environment. Women in management aspiring for leadership positions in Government, political arena or in the private sector. The course is equally useful for women members of parliament and women newly appointed to executive positions. Heightened awareness of gender-specific ways of thinking, your own thinking style, and how to "read" others' in order to achieve a successful outcome. According to the International Finance Corporation, (ifc.org/corporate governance. April 2014), a broad set of business benefits are associated with gender diversity on corporate boards. These broad benefits include; improved financial performance and Shareholders' value, increased customer and employee satisfaction, rising investor confidence and greater market knowledge and reputation. Governments cannot claim good governance if 51% of the population is represented at 2% in top leadership of government ministries and semi-autonomous bodies. Corporations cannot claim good governance when half the population is not represented. Public Policies and Institutions must represent the interests of women and men and promote equal access to resources, rights, and voice. This course will show improved Corporate Board performance when the board has an equitable number of men and women. Corporate governance principles will be revisited from a gender perspective. The course is designed for men and women at strategic levels of policy making and decision making such as permanent Secretaries and Deputy Permanent Secretaries, Directors and Commissioners in the public Sectors as well as Board members of public and private corporations as well as chief executive officers. The organization will access benefits arising from a gender diversity corporate board. According to the project manager at NEPAD secretariat; 'Africa needs gender responsive planning and budgeting'. This was further explained that African women still face institutional, legal, political, environmental as well as socio-economic constraints, which impact their capacity and ability to undertake sustainable livelihoods. UN Women explains that Gender-responsive budgeting (GRB) is government planning, programming and budgeting that contribute to the advancement of gender equality and the fulfillment of women's rights. It entails identifying and reflecting needed interventions to address gender gaps in government policies, plans and budgets. This course therefore aims at equipping government development planners and budget formulators on how to engender their work for sustainable development. Commissioners and Directors from Ministry of Planning/Planning Commission and budget officers from central government as well as the local government. Apply tools to integrate gender in development plans and national/sector budget. Governments and other actors have been urged by the Beijing Platform of Action to promote an active and visible policy of mainstreaming a gender perspective in all policies and programs so that before decisions are made, an analysis is made of the effects on women and men respectively. The goal of gender audit is to contribute to strengthening processes by providing an assessment of any differential impact on males and females because of policies, programs, organizational structures and processes within organizations. Further to this, the goal of gender audit is to identify strategic initiatives that can be implemented to build commitment to and strengthen capacities for gender mainstreaming. Gender practitioners and managers, therefore, need this special skill of conducting a gender audit. People in any organization are a key resource and main drivers of sustainable economic and social development. Investing in the excluded and strategic inclusion of women in top level position of companies has shown that, such companies tend to outperform those that do not (Schwab K; Global Gender Gap, 2014). Strategic mainstreaming gender in leadership and management of Governments and companies will ensure increased performance in service delivery and as well as improved financial status. The scope of this course is to identify barriers to gender equity and equality and establish strategies for successful gender mainstreaming in management. People in any organization are a key resource and main drivers of sustainable economic and social development. Investing in the excluded and strategic inclusion of women in top level position of companies has shown that, such companies tend to outperform those that do not (Schwab K; Global Gender Gap 2014). Strategic mainstreaming gender in leadership and management of Governments and companies will ensure increased performance in service delivery and as well as improved financial status. The scope of this course is to identify barriers to gender equity and equality and establish strategies for successful gender mainstreaming in management. Today's leadership thinkers are emphasizing gender equity and equality (Peters Tom, in Re-imagine 2009). Wilson (2007) states that;' "Closing leadership gap, add women and change everything". African Countries are implementing a women decade (2010– 2020) and yet many officers and employees in many organizations are not aware. This programme aims to train women and men to the critical gender issues and concerns that continue to constrain gender equity and equality in Africa, and continue to hamper planned development efforts. policy as well as an engendered organizational budget. Senior Government officials and Programme/project managers involved in planning and implementing national or regional development programmes and projects. This course is relevant to men and women public servants or as well as those from development oriented NGOs. Gender responsive policy - making and budgeting. It is simply impossible to become a great leader without being a great communicator. Great leaders might talk about their ideas, but they do so in a way which also speaks to their audience' emotions and aspirations. Research findings by Ken Blanchard did show that, inappropriate communication was cited as the number one mistake leaders make. Too often women leaders either don't communicate clearly, over-communicate, or communicate inappropriately through outbursts, anger and blaming., or simply don't communicate clearly. This comprehensive course, is dealing with the unique communication challenges women leaders confront in at the organizational environment as well as in politics. Women in management: Where did they come from? -Communication secrets of great leaders. It is simply impossible to become a great leader without being a great communicator. Great leaders might talk about their ideas, but they do so in a way which also speaks to their audience' emotions and your aspirations. Research findings by Ken Blanchard did show that, inappropriate communication was cited as the number one mistake leaders make. Too often women leaders either don't communicate clearly, over-communicate, or communicate inappropriately through outbursts, anger and blaming., or simply don't communicate clearly. This comprehensive course, is dealing with the unique communication challenges women leaders confront in at the organizational environment as well as in politics. your own thinking style, and how to "read" others' in order to achieve a successful communication outcome. According to the International Finance Corporation, (ifc.org/corporategovernance. April 2014), a broad set of business benefits are associated with gender diversity on corporate boards. These broad benefits include; improved financial performance and shareholders' value, increased customer and employee satisfaction, rising investor confidence and greater market knowledge and reputation. Governments cannot claim good governance if 51% of the population is represented at 2% in top leadership of government ministries and semi-autonomous bodies. Corporations cannot claim good governance when half the population is not represented. Public Policies and institutions must represent the interests of women and men and promote equal access to resources, rights, and voice. This course will show improved Corporate Board performance when the board has an equitable number of men and women. Corporate governance principles will be revisited from a gender perspective. According to the project manager at NEPAD secretariat; 'Africa needs gender responsive planning and budgeting'. This was further explained that African women still face institutional, legal, political, environmental as well as socio-economic constraints, which impact their capacity and ability to undertake sustainable livelihoods. UN Women explains that Gender-responsive budgeting (GRB) is government planning, programming and budgeting that contributes to the advancement of gender equality and the fulfilment of women's rights. It entails identifying and reflecting on needed interventions to address gender gaps in government policies, plans and budgets. This course therefore aims at equipping government development planners and budget formulators on how to engender their work for sustainable development. Research shows that companies with a greater share of women on their boards of directors and executive committees perform better financially. Despite this considerable benefit, many African governments and companies are still missing out on the full benefits of gender diverse leadership teams. Despite improvements and a rising number of women in leadership positions in Africa, women do not necessarily have greater power. In the private sector, more than half of senior women occupy staff roles rather than line roles. In the public sector, approximately half of women cabinet ministers hold social welfare portfolios, with arguably limited political influence, that do not open doors to top leadership roles. This course focuses on helping organizations reap the advantages of gender diversity. Understanding implicit biases will help in designing unbiased, gender-neutral organizations to overcome unwritten but dominant social norms. The course also explores what practices support an organization’s ability to engage and retain (gender) diverse teams. Translate diversity into increased productivity, greater innovation, better decision-making and higher employee retention in an organization. This workshop is aimed at managers from profit, non-profit and governmental organizations who are driven to make diversity work in their organizations. They include: company leaders and managers, women looking to advance into senior leadership, heads of Departments/Divisions and or Executives, Human Resource Personnel, diversity and inclusion practitioners, organization development managers, workplace trainers and change agents, and Deans. People in any organization are a key resource and main drivers of sustainable economic and social development. Investing in the excluded and strategic inclusion of women in top level position of companies has shown that, such companies tend to outperform those that do not (Schwab K; Global Gender Gap 2014). Strategic mainstreaming gender in leadership and management of Governments and companies will ensure increased performance in service delivery as well as improved financial status. The scope of this course is to identify barriers to gender equity and equality and establish strategies for successful gender mainstreaming in management. It is simply impossible to become a great leader without being a great communicator. Great leaders might talk about their ideas, but they do so in a way which also speaks to their audience’ emotions and aspirations. Research findings by Ken Blanchard did show that, inappropriate communication was cited as the number one mistake leaders make. Too often women leaders either don’t communicate clearly, over-communicate, or communicate inappropriately through outbursts, anger and blaming. This comprehensive course, is dealing with the unique communication challenges women leaders confront at the organizational environment as well as in politics. It is simply impossible to become a great leader without being a great communicator. Great leaders might talk about their ideas, but they do so in a way which also speaks to your emotions and your aspirations. Research findings by Ken Blanchard did show that, inappropriate communication was cited as the number one mistake leaders make. Too often women leaders either don’t communicate, over-communicate, communicate inappropriately through outbursts, anger, or blaming, or simply don’t communicate clearly. This comprehensive course, is dealing with the unique challenges women confront in the organizational environment. According to the project manager at NEPAD secretariat; ‘Africa needs gender responsive planning and budgeting’. This was further explained that African women still face institutional, legal, political, environmental as well as socio-economic constraints, which impact their capacity and ability to undertake sustainable livelihoods. UN Women explains that Gender-responsive budgeting (GRB) is government planning, programming and budgeting that contributes to the advancement of gender equality and the fulfillment of women’s rights. It entails identifying and reflecting on needed interventions to address gender gaps in government policies, plans and budgets. This course therefore aims at equipping government development planners and budget formulators on how to engender their work for sustainable development. This workshop is aimed at managers from profit, non-profit and governmental organizations, company leaders, women looking to advance into senior leadership, heads of departments/divisions and or executives, human resource personnel, diversity and inclusion practitioners, organization development managers, workplace trainers, change agents and deans. • Translate your understanding on how to advance women into an actionable improvement plan for an organization. • Design plan of action. • Develop the gender action plans for comprehensive integration of gender equality at all levels of the organization. • Moving from analysis to action plans. The course is designed for leaders looking for solutions to gender mainstreaming at work and improve organizational performance. • Carry out engendered policy formulation and engendered budgeting. • Engendering organization’s plans, programmes and budget. Today’s leadership thinkers are emphasizing gender equity and equality (Peters Tom, in Re-imagine 2009). Wilson (2007) states that; “Closing leadership gap, add women and change everything”. African countries are implementing a women decade (2010– 2020) and yet many officers and employees in many organizations are not aware. This programme aims to train women and men to the critical gender issues and concerns that continue to constrain gender equity and equality in Africa, and continue to hamper planned development efforts. Senior government officials and programme/project managers involved in planning and implementing national or regional development programmes and projects. This course is relevant to men and women public servants as well as those from development oriented NGOs. • Analyze organizational policies and practices so as to promote gender-sensitivity and strategize on how to prepare an engendered equal opportunity employer policy as well as an engendered organizational budget. • Gender responsive policy - making and budgeting. It is simply impossible to become a great leader without being a great communicator. Great leaders might talk about their ideas, but they do so in a way which also speaks to your emotions and your aspirations. Research findings by Ken Blanchard did show that, inappropriate communication was cited as the number one mistake leaders make. Too often women leaders either don’t communicate, over-communicate, communicate inappropriately through outbursts, anger, or blaming, or simply don’t communicate clearly. This comprehensive course, is dealing with the unique communication challenges women confront in the organizational environment as well as in politics. • Have heightened awareness of gender-specific ways of thinking, own thinking style and how to lead others in order to achieve successful outcomes. • Dealing with media; and communication secrets of great leaders. Commissioners and directors from ministry of planning commission and budget officers from central government as well as the local government. • Apply tools to integrate gender in development plans and national/sector budget.